Join author, Alexandra Fuller, for a reading and signing of her new book, Leaving Before the Rains Come. A child of the Rhodesian wars and daughter of two deeply complicated parents, Alexandra Fuller is no stranger to pain. But the disintegration of Fuller’s own marriage leaves her shattered. Looking to pick up the pieces of her life, she finally confronts the tough questions about her past, about the American man she married, and about the family she left behind in Africa. A breathtaking achievement, Leaving Before the Rains Come is a memoir of such grace and intelligence, filled with such wit and courage, that it could only have been written by Alexandra Fuller. Places in the signing line are reserved for those who purchase a copy of Leaving Before the Rains Come from The King's English. Alexandra Fuller -- "Leaving Before the Rains Come"
Alexandra Fuller will speak about and sign her new book, Leaving Before the Rains Come, on Saturday, February 7th at *5:00pm*. 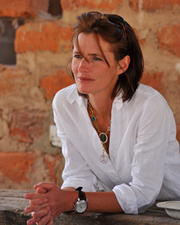 About the Book: A child of the Rhodesian wars, Alexandra Fuller is no stranger to pain. But the disintegration of Fuller’s own marriage leaves her shattered. Looking to pick up the pieces of her life, she finally confronts the tough questions about her past, and about the family she left behind in Africa. Leaving Before the Rains Come is a story of sorrow grounded in the tragic grandeur and rueful joy only to be found in Fuller’s Africa. A child of the Rhodesian wars and a daughter of two deeply complicated parents, Alexandra Fuller is no stranger to pain. But the disintegration of Fuller's own marriage leaves her shattered. Looking to pick up the pieces of her life, she finally faces the tough questions about her past, about the American man she married, and about the family she left behind in Africa. Recalling her unusual courtship in Zambia—elephant attacks on the first date, sick with malaria on the wedding day—Fuller struggles to understand her younger self as she overcomes her current misfortunes. Fuller reveals how, after spending a lifetime fearfully waiting for someone to show up and save her, she discovered that, in the end, we all simply have to save ourselves. Those wishing to get books signed will be asked to purchase at least one copy of the author's most recent title from Vroman's. For each purchased copy of the newest title, customers may bring up to three copies from home to be signed. This policy applies to all Vroman's Bookstore events unless otherwise noted. Save your Vroman's receipt; it will be checked when you enter the signing line. The author of Cocktail Hour Under the Tree of Forgetfulness and Don't Let's Go to the Dogs Tonight returns with a new memoir. Leaving Before the Rains Come begins with the dreadful first years of the American financial crisis when Fuller’s delicate balance—between American pragmatism and African fatalism, the linchpin of her unorthodox marriage—irrevocably fails. Recalling her unusual courtship in Zambia—elephant attacks on the first date, sick with malaria on the wedding day—Fuller struggles to understand her younger self as she overcomes her current misfortunes. Fuller soon realizes what is missing from her life is something that was always there: the brash and uncompromising ways of her father, the man who warned his daughter that "the problem with most people is that they want to be alive for as long as possible without having any idea whatsoever how to live." Fuller’s father—"Tim Fuller of No Fixed Abode" as he first introduced himself to his future wife—was a man who regretted nothing and wanted less, even after fighting harder and losing more than most men could bear. Leaving Before the Rains Come showcases Fuller at the peak of her abilities, threading panoramic vistas with her deepest revelations as a fully grown woman and mother. Fuller reveals how, after spending a lifetime fearfully waiting for someone to show up and save her, she discovered that, in the end, we all simply have to save ourselves. An unforgettable book, Leaving Before the Rains Come is a story of sorrow grounded in the tragic grandeur and rueful joy only to be found in Fuller’s Africa. Alexandra Fuller was born in England in 1969. In 1972, she moved with her family to a farm in southern Africa. She lived in Africa until her midtwenties. In 1994, she moved to Wyoming. She has three children. Calling all moms, whether you be mother or stepmother to an infant, toddler, tween, or adolescent, we have a new book group at the store just for us! Motherhood by the Book is led by Claire, VB staffer, mother of a kindergartner, and stepmother of an adolescent. (And we don't mean board books or indestructibles--You know, the ones with the pages that you can chew.) No, we mean real, honest-to-goodness, grown-up books! A story of survival and war, love and madness, loyalty and forgiveness, Cocktail Hour Under the Tree of Forgetfulness is an intimate exploration of Fuller’s parents and of the price of being possessed by Africa’s uncompromising, fertile, death-dealing land. What’s better than talking about a book with a group of friends? Talk about a book with a group of friends during Happy Hour at Opa (2050 S. Lamar Blvd)! Come hang out with Mandy and Joel the last Thursday of every month at 5:30pm where we'll discuss books over cocktails. This month's book is Don't Lets Go To The Dogs Tonight by Alexandra Fuller. Bookworks longest-running book club meets to discuss this month's selection, The Legend of Colton H. Bryant by Alexandra Fuller. Alexandra Fuller is currently considered a "single author." If one or more works are by a distinct, homonymous authors, go ahead and split the author. Alexandra Fuller is composed of 4 names. You can examine and separate out names.